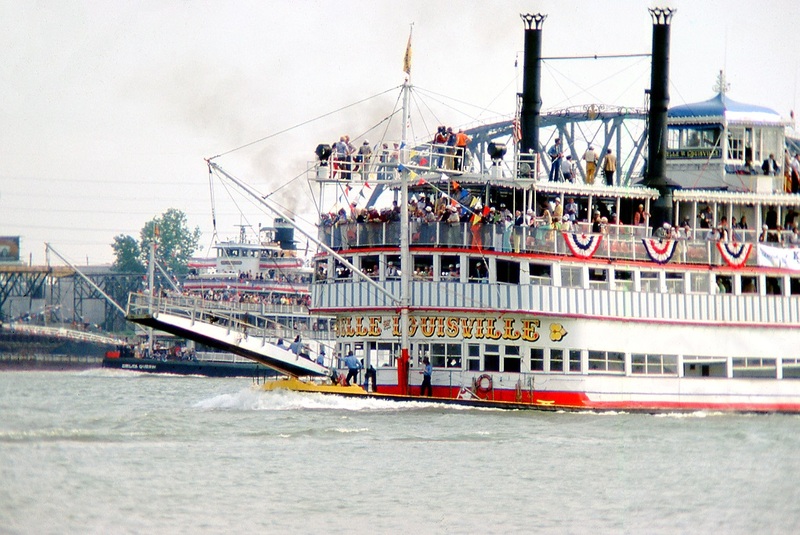 Scanned from a color slide of a race between the DELTA QUEEN (in the distance) and the BELLE OF LOUISVILLE (in foreground). Photographer unknown but probably took prior to Kentucky Derby Day on the Ohio at Louisville, Kentucky. MRS. LETHA C. GREENE, PRES. LIBERTY NATIONAL BANK Starks Building Arcade ~ 416 W. Jefferson St.
DON'T MISS THIS GALA EVENT. 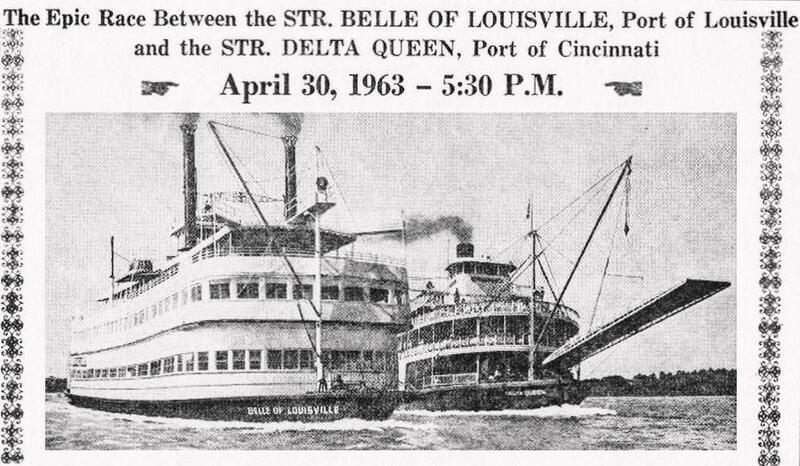 Letterpress "broadside" poster advertising tickets for the Tues April 30, 1963 race at Louisville on the Ohio River between the DELTA QUEEN and the BELLE OF LOUISVILLE. The size of the original letter press type set poster was 7 x 19 inches. Our thanks to S.M. Frisby for sending in this clipping. It appears to be from the Delta Queen Calliope newspaper. Any ideas? Thanks also to Dave Thomson for restoring the image. 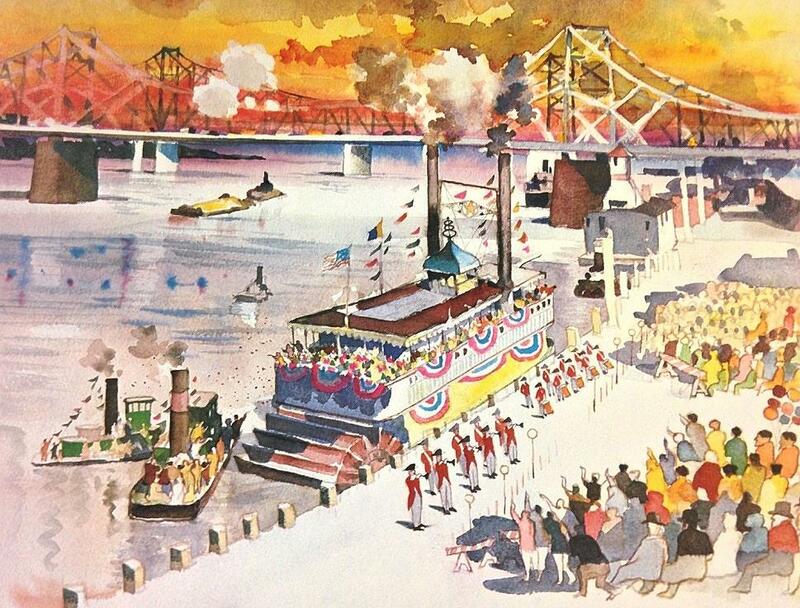 Sponsored by the Kentucky Derby Festival Inc.
1979 watercolor of the BELLE OF LOUISVILLE on the Ohio River at Louisville, Kentucky. Dong Kingman 1911 - 2000 was a Chinese American artist and one of America's leading watercolor masters. As a painter on the forefront of the California Style School of painting, he was known for his urban and landscape paintings. Dong Kingman was born Dong Moy Shu in Oakland, California, the son of Chinese immigrants from Hong Kong. At the age of five and a half he traveled with his family back to Hong Kong, where his father established a dry goods business. He began his formal education at the Bok Jai School, where he was given a school name in accordance with Chinese customs. Hearing that he aspired to be an artist, his instructor gave him the name "King Man" (lit. "scenery" and "composition" in Cantonese). He would later combine the two names into Kingman, placing his family name first in accordance with Chinese naming conventions, creating the name Dong Kingman. Kingman returned to the United States in his late teens. In 1929 he attended the Fox Morgan Art School while holding down a variety of jobs. It was at this time that he chose to concentrate on watercolor painting. His critical breakthrough occurred in 1936, when he gained a solo exhibition at the San Francisco Art Association. This exhibition brought him national recognition and success. During the 1950s, Kingman served as a United States cultural ambassador and international lecturer for the Department of State. In the 1950s and 1960s, Kingman worked as an illustrator in the film industry, designing the backgrounds for a number of major motion pictures including "55 Days at Peking", The Sand Pebbles and Hollywood's Technicolor film of Rodgers & Hammerstein's musical "Flower Drum Song." 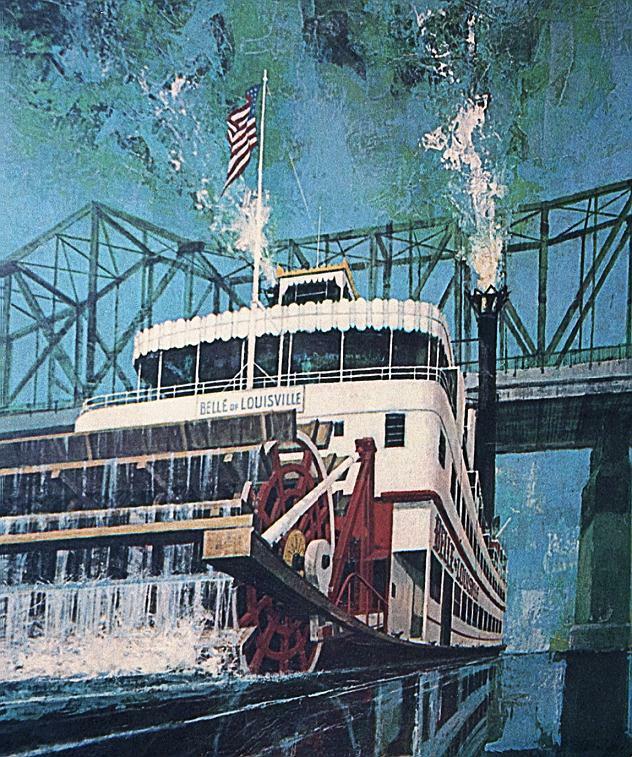 Detail of a framed print/poster in the offices of the BELLE OF LOUISVILLE aboard their headquarters in the 1929 Life-Saving Station No. 10. Appears to date back to the '60's, lining up the boat and bridge in stylized perspective with sky & water applied with palette knife using fine art/illustration techniques. Art experts and critics can interpret it further. Prints of Wehder's painting "Kentucky Wild Cat" were published in 1979 and a number of them can be found online. The site Worth Point states that Eric Wehder Jr. immigrated from Germany and became a resident to Kentucky where he was commissioned to produce paintings and sculptures for the University of Kentucky. By Kenan Heise, Tribune Staff Writer. William C. Olendorf, 71, an internationally recognized painter, illustrator and printmaker, also had a long career as an advertising executive. A resident of the Near North Side in Chicago, Bill Oldendorf died Wednesday, February 28th at his home. Mr. Olendorf had a studio in Tree Studios at Ontario and State Streets in Chicago. His style was considered neo-impressionistic. His paintings were principally landscapes and cityscapes, based on photos he had taken while traveling extensively. He was strongly influenced as an artist by Ivan Albright. He held exhibitions of his works in museums in Paris, Stockholm and Mykonos, Greece, as well as New York and Chicago. Mr. Olendorf illustrated several books, including the Sketchbook Series, which focuses on Paris, Chicago and Palm Beach, Florida. Recently, he established the William Carr Olendorf Foundation, dedicated to the education of young artists who emphasize representational art and who need financial assistance or mentoring. A native of Deerfield, Illinois he attended Harvard University and Washington & Lee University in Lexington, Virginia. During his career as an ad executive, he worked for Leo Burnett, Foote Cone & Belding and Peterson Publications. He also was with Tobias and Olendorf and The Promotion Network. Survivors include two sons, Donald and Bill. A memorial gathering will be held from 1 to 3 p.m. Sunday in the Claridge Hotel, 1244 N. Dearborn St. Chicago, Illinois. 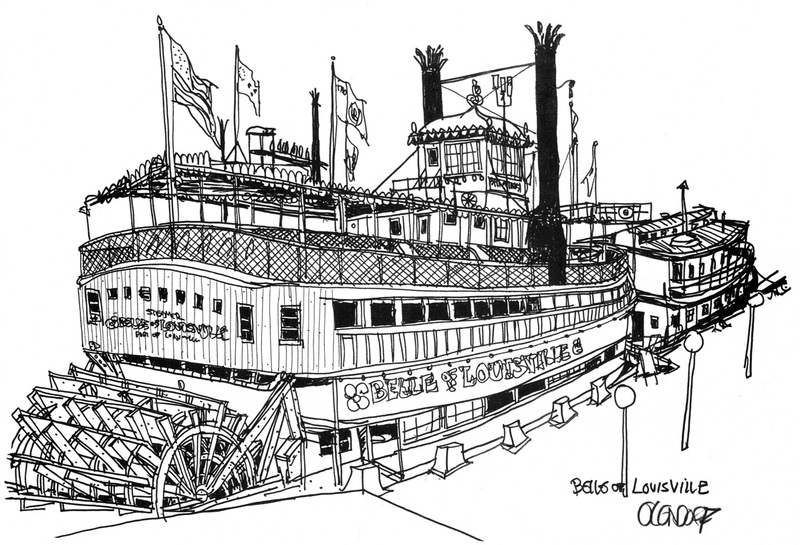 Search YouTube for Belle of Louisville videos - click here!